Ivan Denisovich is a Russian soldier during WWII. He’s captured by the German army, but manages to escape. Unwilling to believe that he could have possibly gotten away from the Germans, the Russian army assumes he must be working with the Nazis as a spy. They put him in a Siberian prison, sentenced to ten years of hard labor when he didn’t even do anything wrong. 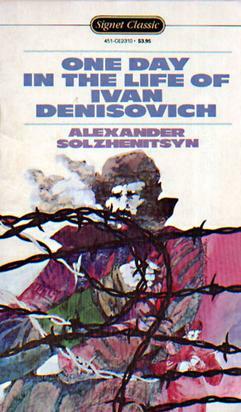 The short novel was written by Aleksandr Solzhenistsyn after he spent almost ten years in a Russian prison camp. It was written in the early 1950s and was one of the first pieces of literature that the Communist government allowed to be published that spoke ill of the regime of Josef Stalin. Ivan Denisovich opened the world’s eyes to the cruel treatment and harsh conditions Russian prisoners dealt with, earning its author a Nobel Prize for Literature. The story follows one day in the life of prisoner Ivan Denisovich Shukhov from wake up call, through meal times, and a day of manual labor in the freezing Siberian winter. The story is told from Shukhov’s perspective, giving us his take on how to survive both physically and psychologically in the torturous camp – how to deal with other prisoners, guards, lack of food, and the work. Ivan becomes a very sympathetic character who shows us just what it takes to get by.